Galerie Durand-Ruel, Paris (nos. 10402 & 13375). Galerie Bernheim-Jeune, Paris (no. 4387). Acquired in Paris in the 1930s by the parents of the present owner and thence by descent. Unlike his contemporaries in the Batignolles group of the 1860s, such as Monet, Sisley and Bazille, Renoir showed little interest in still-life at the beginning of his career. From around 1880, however, it began to occupy an increasing importance in his output, underlining the 'academic' approach that influenced his art and that was perhaps only surpassed within the Impressionist generation by Cézanne. 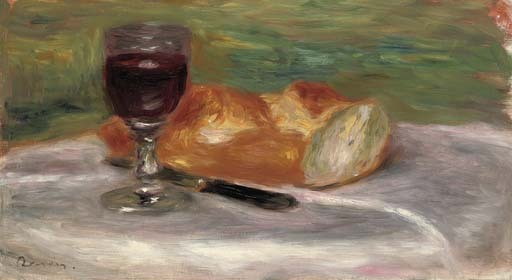 Renoir recommended to Manet's niece Julie to paint still-life 'in order to teach yourself to paint quickly' (quoted in J. Manet, Journal, 1893-1899, Paris, no date, p. 190), and the numerous works, often elaborate and ambitious, which he executed in this genre over the course of his career attest to his sustained interest in still-life as an end in itself. Indeed, it was in his still-life compositions that Renoir pursued some of his most searching investigations of the effects of light and colour on objects and surfaces.